Just as we were finally getting the hang of getting around Shanghai, it was time to depart for Beijing. We took the bullet train and it was fantastic. The train got up over 300 km/hr, the seats were comfortable and just a lot less hassle than going to an airport. Before we knew it we had arrived and dropped off our stuff at our hotel. We really came to love this hotel that was well priced, had a hostel feel, and a great coffee bar for breakfasts. Around Beijing there are different streets and neighborhoods that are referred to as hutongs. It was kind of a mystery to us what comprised a hutong and what didn't. Sometimes it seemed to be if it was an old neighborhood that still had the same architecture from hundreds of years ago, other times it was because it was a busy shopping and restaurant district. Our street was called Lishi Hutong and was lined with all different types of Chinese restaurants. Over a span of just a couple blocks, there were places that served skewers, duck, donkey burgers (yep you read that right), hot pots, noodles and more. Between the food choices, and a subway a five-minute walk away, we were thrilled with our location, very key in a huge city like Beijing. We had a full week in Beijing but experience has taught us with so many activities we wanted to check off, the time would go fast. To keep our energy up and mood light over these six months, we like to spread out our days versus trying to pack in four sightseeing things all at once, burning out and leaving our last few days with not a big agenda. Before we arrived it all seemed overwhelming, with the culture difference and language barrier. But we learned that the locals will try and help and the public transit is really easy so it will be just fine, as long as you constantly keep your head up for mopeds and cars running through the crosswalks! Below are our highlights and recommendations of Beijing. Hou Hai Lake is a huge shopping, restaurant and bar area encircling an entire lake. We went for a walk around here during the day and it was fairly peaceful minus the hosts at the bars working to wave us in for a happy hour beer. Come nighttime this place has a completely different vibe and was a party scene. You look one way and its food stands, another direction is venue after venue with live music, another place has go-go girls with a DJ playing music on the side; and everywhere people are drinking, smoking shisha and having a great time. So much for buttoned up communist China. We found a bar that had some seating, had reasonably priced cocktails and shisha, and took in the overall craziness of the scene. Anyone looking for a good time in Beijing should make their way to Hou Hai. 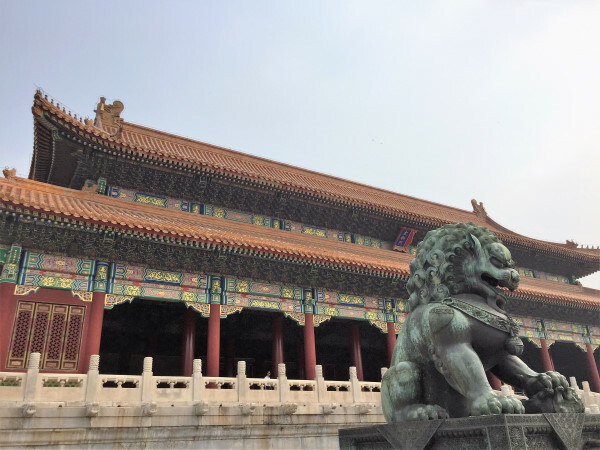 Beijing has so many historical sites to see that it may feel overwhelming to decide which ones to visit. At some point the temples and palaces start to look and feel similar but there were definitely a few that stood out to us as worthwhile stops. Right near a subway stop sits the Temple of Heaven on one side of the street and the Pearl Market directly across from it on the other side of the street. We grabbed a quick and delicious Dim Sum lunch at a food court under the Pearl Market and then headed over to the Temple of Heaven. The grounds are massive and you can buy an entry ticket that allows you to enter the grounds and see the main temples all at the front gate. There are additional exhibits you can see as well but for some reason you need your passport to enter these sections, and we left ours at the hotel. Either way, the temple was really a site to see and worth a trip. Once you have gotten your fill of exploring the grounds then head across the street to the Pearl Market. This place has all the knockoff goods you could want and everything can be bargained for. Stephanie and I have gotten fairly decent at the bargaining process after visiting so many different Asian countries but thought China may be a bit tougher. Well the process at the Pearl Market ended up being quite straightforward; the nice seller will state a price that is about four times too much, smile and say “Oh No”, they give you a calculator and say “ok how much can you pay?” At this point whatever amount you essentially tell them you should get close to as your final cost, as all the stands here are selling basically the same stuff and they want your business. Steph got a knockoff Longchamp (I mean it’s definitely real to all you Gold Coasters checking out her new bag!) and I got some fake Nikes in about twenty-minutes total. Done and done, mission accomplished, no extra shopping for these two. An area of town we really enjoyed exploring was the 798 Art District. The neighborhood was filled with art galleries covering all different styles and mediums of expression. One highlight for us was a gallery that had many of the colorfully painted cows that were in downtown Chicago a few years back! Of course no hipster art scene would be complete without many cafes offering great coffee, food and pastries. We definitely recommend heading this way if you have the time. On the contrary, we headed over to the Olympic Green to see the sight where many activities were held during the 2008 Summer Olympics. Beijing has done a nice job keeping the area intact unlike many Olympic cities that seem befuddled what to do with all the new stadiums they built once the games end. The problem for us was the main stadium was closed for the day for viewing and “the cube”, the water center where Michael Phelps won all his gold medals has been turned into a water park for families. Great for locals, not ideal for tourists. I’d say skip the schlep over to this part of town if you are short on time. I mentioned above to keep an eye out for drivers when walking. That’s because everywhere you look there is someone on a bike, moped and car. Unlike Vietnam where regardless how many mopeds there are, they all effortlessly seem to weave around you, in Beijing the mopeds are on the sidewalks and the cars firmly believe right on red is their God given right of way. Plus, everyone is honking left and right; the government recently instituted that mopeds must be electric to help counter pollution which is great, except for the fact they are near silent so drivers honk to get your attention. With this being said, it’s nice when you can spend time on walking streets where drivers are few and far between! Two of our favorites were Qianmen and Wangfujing. Both have a variety of food and shopping options. Shopping wise there are markets selling the standard Asian wares, along with nicer stores; at one we got a great set of chopsticks for home. For eating, both have restaurants wanting you to have a seat inside, but it’s the little food stands where the real tasty treats are at. Fried squid, potato twisters (kettle chips on a skewer), matcha ice cream and so much more are worth the trip to see these streets. 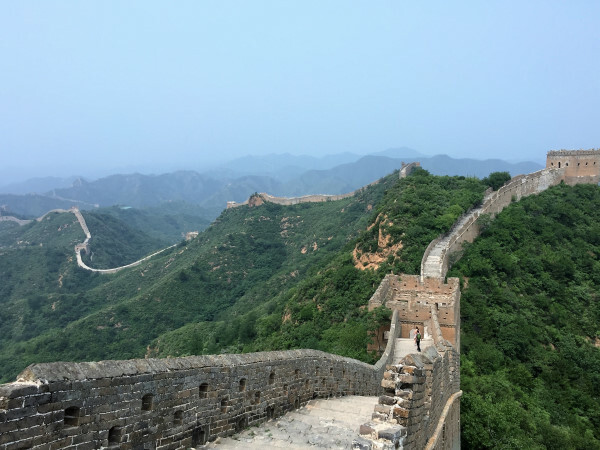 One of the true wonders of the world, the Great Wall was definitely the number one thing on our Beijing priority list. We knew we didn't want to do a big group tour or encounter the part of the wall that is flooded with Chinese tourists, thus making the hike seem more like the process of slowly shuffling out of Wrigley after a game. We found a couple different DIY options and ended up deciding on the Jinshanling portion, which was a bit further from Beijing but highly recommended by fellow travelers. The first step was getting there and getting information online was a backwards process, where one site would say one thing and then another site would say something completely different. We ended up trusting a Chinese info site and it paid off. We took a tourist bus that is government run, it was just under a two-hour ride to our starting point. From there a free shuttle awaited to take us the ticket booth and starting gate. At Jinshanling you can start from the West, Main or East gate. To get to the actual wall you have to hike up a fairly steep path and we read that a gondola is available that skips this portion so you can start on the wall. Well we asked our shuttle driver where the gondola was. He didn't speak English but a younger guy was there with his family and translated for us, and his response to our question about the gondola was, “Gondola for old man and babies.” Well then, let’s not act like weak Americans then, off we go. It ended up being a tough and enjoyable hike up and we were glad we did it. All together we spent about three hours hiking from tower to tower, overlooking the picturesque views and going up and down, up and down some more, stairs, stones, and steep concrete paths. It was definitely an activity to cross off our bucket list and we recommend doing the hike on your own versus a busy crowded tour if you have the option. Stephanie enjoyed making as many Game of Thrones quips as possible during our time on the wall. See our full photo essay of the wall here. This was another area comprised of beautiful temples, views and grounds to walk and explore. We recommend going up in the Buddha Incense tower for the 360 degree views of the city and walking the grounds to see the different temples and find the marble boat as well. The grounds sit on the lake so many visitors also were renting pedal boats as a way to take in the scenery. It’s actually quite a hike up to the top and we paid the extra fee to see the beautifully ornate Buddha Incense Tower before heading down to the Long Corridor and the Marble Boat. The drum and bell towers are a great way to start the day, as you get a little history and exercise in one fell swoop. These two towers are on opposite ends of a closed off stone street and we recommend you hiking up both. The stairs are steep but if you are not an old man or a baby, you’ll be good to go. The bell is really impressive due to its sheer size and the drums were hundreds of years old. Once you finish here start a self guided Hutong tour of the area. There will be locals trying to sell you a tour on their bikes and while this will keep you off your feet, you will miss out on getting up close to the old architecture. We weaved throughout the different streets and alleys and Stephanie really enjoyed the old doors, roofs, and intricately designed door knockers. Family members of past dynasties used to live in these homes and it was something to see that they were still in existence today. This area also has some great food options that will keep you full as you explore. The last big tourist stop on our itinerary was to Tiananmen Square and into the Forbidden City. A couple tips, the Forbidden City is closed on Mondays and you need your passport to buy a ticket for entry. The history of this whole area hits you pretty quickly as you approach the entrance with the huge portrait of Mao on the gate. It was a scorcher the day we toured, so we made sure to see each temple but also didn't linger too much. It took us a little under ninety minutes to finish but we had heard that sometimes people spend well over two hours there. It is definitely worth a visit but at the same time we were a bit underwhelmed. Maybe there was too much of a buildup in our heads for what it would be and we just enjoyed the Summer Palace more. What was really great though was hiking a path for an amazing view that overlooks the Forbidden City. A nice family we met the night before recommended we do this, and we were really happy they did. For a very cheap entrance fee, this really beautiful park sits just across the street from where everyone exits the Forbidden City. Very few people then seemed go to this park, either because they are with a tour or simply unaware it exists. Even though we were tired from the heat, the views made the hike completely worth it! 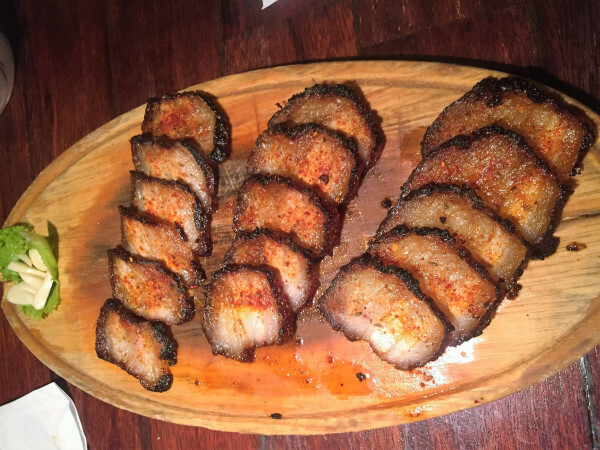 Eating – Peking Duck, Skewers, Hot Pots and More! Last but certainly not least according to these foodies is to eat up a storm in Beijing. There was such a variety of cuisines and we never felt like we were very far from the next amazing option. One night we grilled our meat and veggies in a hot pot, kind of like fondue but with seasoned boiling water. There was never a bad time to have a skewer be it lamb, beef or chicken. Of course dumplings and noodles are always a good choice. I even went back another day for my second donkey meat sandwich because it was surprisingly so tasty. 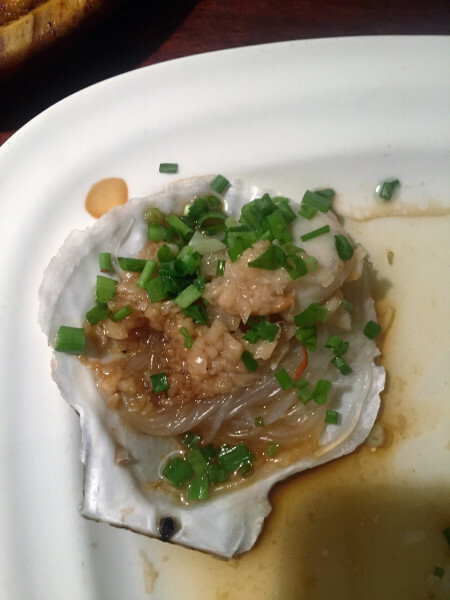 A couple restaurants really stood out to us and we highly recommend them if you are ever in Beijing. First was a place called Grandma’s restaurant in the APM mall off Wangfujing. We went based off a recommendation but prepared, because we were told it has great food, is fairly priced and everyone knows this! We waited around forty minutes and luckily they had an easy to follow number system displayed on LCD boards to follow where you are on the waiting list. Once we were seated, we definitely over-ordered and over ate with no regrets. Green onion pancake, grilled eggplant, bullfrog in curry with vegetables, scallops and more, this was fantastic. Our other feast was at a place specializing in Peking Duck, named Li Qun Roast Duck Restaurant. 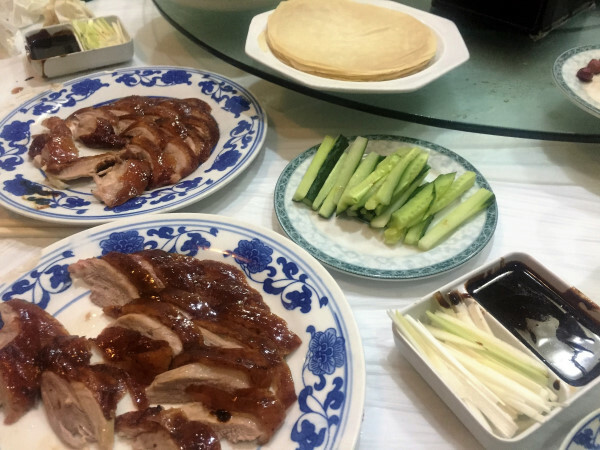 Peking Duck is a must have when in Beijing and Li Qun didn't disappoint. It was definitely the priciest meal we have had in a long time but it’s not that often you happen to be in Beijing. The duck was sliced table side, served with great plum sauce, cucumbers, and thin crepes to wrap it all together. Everything was delicious and just thinking about it now is making my mouth water all over again! When all was said and done we truly enjoyed our week in Beijing. The air wasn't very clean, the motor bikes were incessantly honking and the menus were often hard to decipher. Yet there was always a sight to see, an easy way to get there and a new delicious snack to try once you’ve arrived. Sometimes when traveling that’s all you really need!